Luke Campbell Donald who is the current World No.1, though a member of the European Tour, plays mainly on the U.S. Based PGA Tour. He began his professional career in 2001 and by 2006, he had reached the top 10 in the Official World Golf Rankings. In January 2007, he was briefly the highest ranked European golfer and by May 2011 Donald had became the No.1 in the World Rankings after winning the BMW PGA Championship. He has won the 2011 PGA Tour money list title and presently also leads the European Tour money list. Luke Donald met his life partner, Diane Antonopoulos, while attending Nortwestern University in Evanston, Illinois. He proposed to her in June 2006, and they got married on 24 June 2007 in Satorini, Greece. Their f1st child, Elle Georgina Donald, was born on 25 February 2010 and his wife has given birth to their 2nd child very recently. 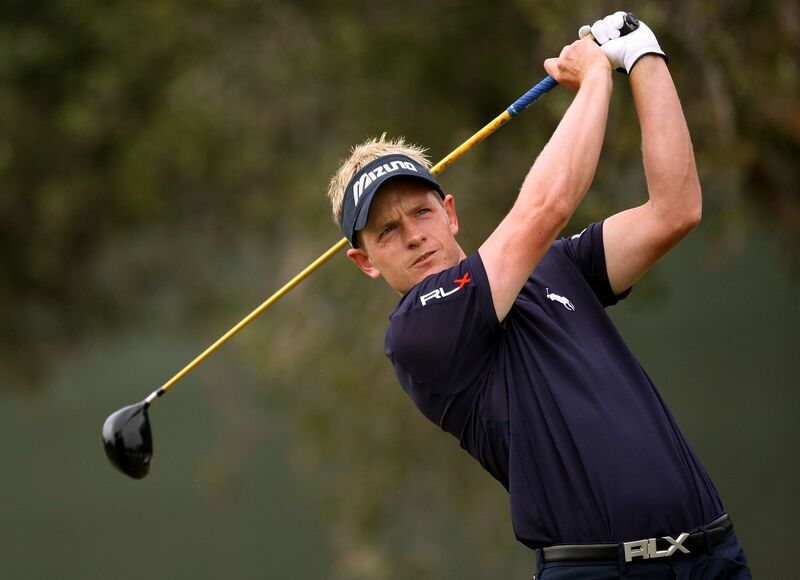 Luke Donald has signed a contract with sports management company IMG and also has a multi-year contract with Mizuno Corp. As part of this sponsorship Luke Donald plays with Mizuno Fairway Woods, Irons and Wedges. Luke also uses a Mizuno bag, headcovers and umbrella. It has been said that he earns $1 million just for wearing his Mizuno visor, and this could quadruple if he wins a major event such as the Masters. Luke Donald also has a sponsorship deal with Footjoy, who sponsor his shoes. In February 2007, that Luke Donald has signed a new multi-year contract with the luxury apparel company, Polo Ralph Lauren . Luke will continue to serve as a worldwide brand ambassador for Polo for their RLX Golf range. Polo has been the exclusive apparel sponsor of Luke Donald since 2002 and he will continue to wear clothing from the RLX collection and will be featured in its advertising campaign. In 2002, Luke Donald won the Southern Farm Bureau Classic, becoming only the 11th rookie in PGA Tour history to earn more than $1 million in his first season. By the early 2005, he was in the top20 of the Official World Golf Rankings and his victory in the 2006 Honda Classic moved him into the top 10 for the first time. Soon, he moved up to 9th and in January 2007 he moved up to 7th place in the world. Till now, Luke Donald has earned a whopping sum of about $25,348,410 on his PGA Tour as well as over €7,000,000 on his European Tour. Luke Donald has graduated in Art Theory and Practice, and enjoys painting when not on tour. In 2002, one of his oil paintings was auctioned off by the PGA Tour for charity reasons. Both Donald and his wife are avid collectors of contemporary art. When we think of Luke Donald the first thing that crosses our mind is the rhythm and the perfectly balanced finish, which make his golf swing appear graceful and uncommonly effortless. In his golf videos, you'll notice that he uses a weight on the club shaft which helps him to further ingrain his smooth rhythm. Luke Donald strongly believes that most amateur golfers would become better putters if they followed a few basic fundamentals and took more notice of the game from a psychological point of view, rather than focusing purely on techniques. "Psychology plays a vital part in putting. ", says Donald, presently 2nd in the PGA Tour's putting average with 1.71 putts for every green he has found in regulation and 4th in putts per round with 28.12. When Luke Donald prepares for a tournament, the closer he gets to competition date, the more he shifts his focus towards golf, hitting shots, focusing on the target and away from his swing mechanics. 1st Day 70% focus on swing mechanics and technique 30% focus on shaping shots and hitting specific targets. 2nd Day Attain a 50/50 balance between technique and targets. 3rd Day 70% shots are hit with a shot shaping and target focus 30% shots to work on his technique. Upon approaching impact, Luke Donaldís hands are in their proper position, with this left wrist flat and his right wrist bent back. But this is different from their position at address, with the left wrist bent and the right wrist flat, and is a change that all great ballstrikers achieve which is proof that impact and address are not the same. With his club tracking precisely on plane with the approaching impact, thereís no need for him to make adjustments to the clubface. The toe of the club will overtake the heel and needs no extra manipulation from his hands to become square. This is a critical technique to create perfect iron shots. Donaldís left arm hangs nearly perpendicular to the ground. This is the result of his quiet hips and helps to minimize the amount of hand action required during the impact. Suppose the left arm is allowed to push out away from the body, the clubface opens more and there is a need for manipulation to get back to the square. The key to Luke Donaldís control lies with his hips. As they begin to open before an impact with a subdued and delayed action which serves 2 specific purposes. Firstly, the lack of early hip rotation allows the arms to remain close to his body. Secondly, any excessive upper-body tilt caused by overly active hips is prevented. Luke Donaldís great body position keeps his arms close with his right arm pointing directly at the ball. Since this is on plane, his hands will be lower at impact than the other players, giving him a better control of the trajectory of his iron shots. I'M SURE WE WILL HEAR MUCH MORE IN THE NEAR FUTURE ON LUKE DONALD.